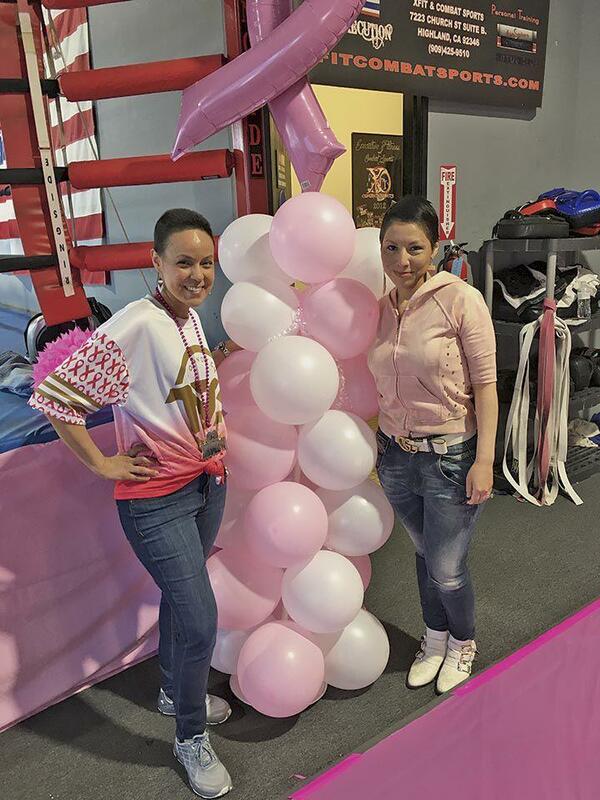 On Sunday, March 17, Highland resident Alaina Ramos Matthews teamed with Susan G. Komen Inland Empire to inspire, celebrate and connect “Survivor Warriors” in their battles against breast cancer with the Big Wig Knocks Out Cancer fundraiser at X Fit Combat Sports in Highland. Susan G. Komen Inland Empire, led by Executive Director Jill Eaton, raises funds for grants to further breast health education, diagnostic services and patient support and treatment. While Eaton is led by her own passion to serve the community her true passion to prevent and find the cure stems from discovering that her own grandmother had dealt with the disease along with friends. Toward this passion, Komen Inland Empire has set the goal, though its support of cancer-fighting organizations, to help reduce breast cancer by 50 percent by 2026. Matthews, daughter of Rowena and James Ramos, was also brought into the fight and connection with Komen Inland Empire when cancer arose within her family. Her niece was diagnosed at 30. At first, Alaina felt helpless in her niece’s fight, but she learned she could be a help through prayer and spiritual support. Then she turned that process to raising awareness. “Some things close to your heart you just do,” said Matthews about her passion to raise awareness and commitment to raise $35,000 for Komen IE. Through social media and other marketing campaigns Matthews had raised about $34,000 going into the Sunday’s special event. To help build community in awareness survivors Melonie Calderon and Marisol Inzunza were invited as special guests. Together they rallied women and families to take care of their health and be proactive in testing and treatment against breast cancer. Melonie Calderon, in March 2018, found out that she had breast cancer by accident. Calderon’s puppy jumped on her chest; that’s when she discovered a lump. Calderon had never taken checking for lumps in her chest very seriously. She now encourage people to take charge of their own health, sharing that her doctors where telling her that it was only a cyst. Calderon pushed forward. She insisted on being tested, she found out it was breast cancer. This plays an important factor because she can now move forward toward treatment. Support is a vital key element. Sergio, Melonies’s husband stepped up to the plate. Sergio’s support allowed her to rest and focus on the vision to heal. Support is important because loneness steps in. She says she is fortunate with her family support. It is important for her to voice to the public that you can receive a lot of support that you need from the organization. Today Melonie is cancer free. She wants everyone to know to take charge in regards to your health, and continue to enjoy life. Marisol Inzunza discovered lumps under her arm pit at 39. She never had a mammogram. Her message is to be proactive. It is important to always check and touch your breast. She suggests once a month with your menstrual cycle. Second, she suggests that women be their own director through the process. If, you know exams, screenings are needed get them done right away. For success reach out to Susan G. Komen Inland Empire, they can also be your advocate. The organization can help you to take charge and help with resources for insured and uninsured patients. Inzunza emphasizes that support groups are a vital element of healing. Inzunza is a success with her formula of motivational spirit and the teamwork of family and friends. One she is proud to share with you today.